Located in Cooma, our florist creates stunning arrangements for all occasions using the freshest blooms then ensures delivery with efficient and friendly service. We deliver to a wide variety of locations in and around the local area including hospitals, medical clinics, retirement communities, aged-care facilities, churches and other places of worship, cemeteries, crematoriums, funeral homes, workplaces and private homes. Hospitals and medical clinics within our delivery area include Cooma Hospital and Health Service, Bombala District Hospital, Snowy River Health Centre and Sharp Street Surgery. Deliveries can also be arranged to a number of retirement communities and aged-care facilities such as Yallambee Lodge, Sir William Hudson Memorial Centre Nursing Home and Snowy River Hostel. Churches and other places of worship to which we deliver include St Paul�s Anglican Church, Cooma Baptist Church, Cooma Community Christian Church, St Andrew�s Uniting Church and St Patrick�s Catholic Church. We also deliver to cemeteries, crematoriums and funeral homes such as Cooma Cemetery, Michelago Cemetery, Nimmitabel Cemetery, Bredbo Cemetery and Allens Funerals. Flowers go hand in hand with birthday celebrations and our extensive selection allows you to choose the perfect arrangement to suit the personality of your friend or loved one. Our �Serenade� arrangement provides a wonderful contrast in colour with its combination of pink roses, golden lilies and lavender daisies. Bright, bold and full of vitality � the perfect way to celebrate a birthday. 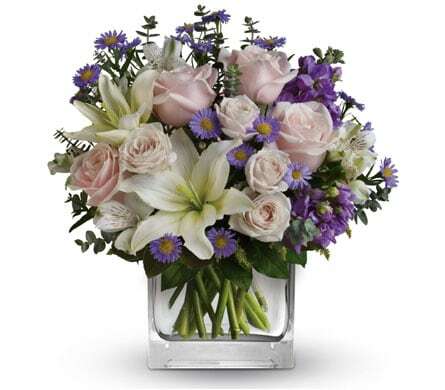 �Simply Stunning� also uses a number of different blooms in various colours to present a visual feast for the eyes. A gift that is sure to be appreciated by the lucky recipient. All of our arrangements can be given an extra special touch by adding one of our range of balloons, teddy bears and boxed chocolates, which are available in a variety of sizes. The New South Wales town of Cooma is located 397 kilometres south-west of Sydney and 116 kilometres south of Canberra. It is the largest town in the Snowy Mountains region and has benefited from a number of travellers using it as a convenient stopping point on their way to the nearby snowfields. Surrounding towns include Adaminaby, Bredbo, Nimmitabel, Carlaminda, Coolringdon and Rock Flat. The name Cooma is believed to have derived from the Aboriginal word �coombah�, which means either �big lake� or �open country�. Cooma was surveyed in 1840 and gazetted in 1849. In 1949, Cooma was chosen as the headquarters for the Snowy Mountains Scheme, with the town growing substantially due to the large numbers of workers required to complete the massive project.